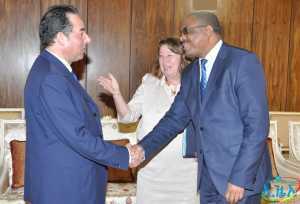 Addis Ababa, April 1, 2016 (FBC) – Prime Minister Hailemariam Dessalegn has held talks today with Daniele Cardella, Head of the President’s Cabinet at the European Parliament, on ways of consolidating peace and stability in the east African region, climate change, development and migration. During the occasion, Hailemariam said EU has been one of Ethiopia’s major development partners in areas of health, education, infrastructure development, and poverty eradication. EU’s role as a development partner has contributed to the economic achievements of Ethiopia, the prime minister said, further urging EU to strengthen its support. He also briefed the head about his country’s efforts in building democracy, protection of human rights, and bringing peace and stability in the region. The premier has called on EU to continue its financial support to African Union Mission in Somalia (AMISOM). Cardella said on his part that EU will help Africa and Ethiopia to build infrastructure, expand education, employment, and reinforce democracy.